I MEET YOU in the stillness of your soul. It is there that I seek to commune with you. A person who is open to My Presence is exceedingly precious to Me. My eyes search to and fro throughout the earth, looking for one whose heart is seeking Me. I see you trying to find Me; our mutual search results in joyful fulfillment. Stillness of soul is increasingly rare in this world addicted to noise and speed. I am pleased with your desire to create a quiet space where you and I can meet. Don’t be discouraged by the difficulty of achieving this goal. I monitor all your efforts and am blessed by each of your attempts to seek My Face. For the eyes of the Lord run to and fro throughout the whole earth, to show Himself strong on behalf of those whose heart is loyal to Him. In this you have done foolishly; therefore from now on you shall have wars. He makes me to lie down in green pastures; He leads me beside the still waters. 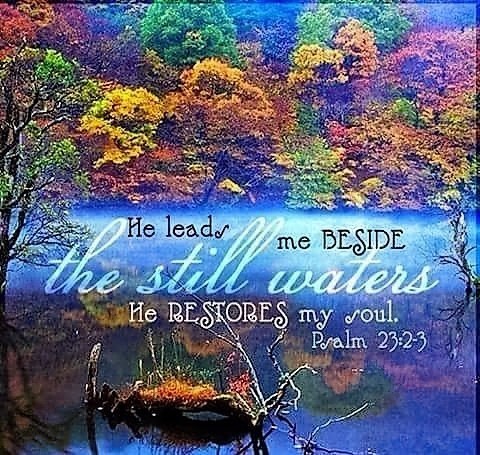 He restores my soul; He leads me in the paths of righteousness for His name’s sake. Dear Lord God, Abba Father, Jesus my Savior, thank You this new day and for Your continued blessings for me and mine. For all You bring my way throughout the day and night. For Your gentle touch that always leads me back to You, where I find peace, direction with enough understanding and wisdom to continue my one walk with You one day at a time. Thank You, I’m sorry I let You down so much, forgive me, I love You. This entry was posted on April 4, 2019 at 6:25 am and is filed under One Walk. You can follow any responses to this entry through the RSS 2.0 feed. You can leave a response, or trackback from your own site.